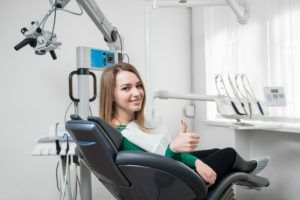 Introducing the first advanced-grade diode laser in dentistry that offers more power and innovation than any diode on the market. 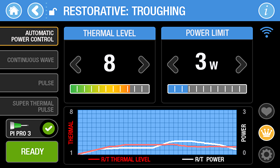 Epic Pro monitors and measures the temperature of the laser tip for predictable, consistent results with every use. 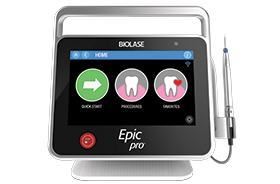 Epic Pro is the ONLY FDA-cleared laser with Automatic Power Control, an exclusive innovation from BIOLASE that enables the operator to lase with confidence and speed. Epic Pro is the professional’s choice for managing soft tissue cases. 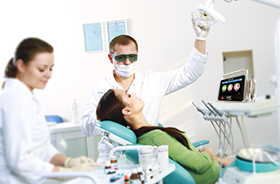 With over 20 clinical presets, multiple treatment modes, and an advanced mode for expert users, Epic Pro provides unparalleled consistency and predictability. Unlike traditional diodes, Epic Pro moves quickly and with little snag-and-drag resistance. Epic Pro brings more precision and comfort than traditional diodes due to innovations such as Super Thermal Pulse mode, which can pulse energy as quickly as ten-millionths of a second, resulting in efficient clinical cutting with less thermal damage than normal diode lasers. 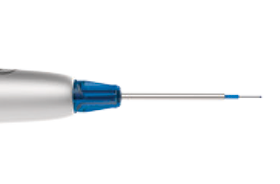 Epic Pro uses new durable tip technology, available in uninitiated and pre-initiated formats depending on your clinical needs. Epic Pro tips work hand in hand with the laser’s Smart Tip technology to prompt you when a fresh tip is needed. Fill out the contact form on this page to request a quote and live demonstration for Epic Pro in your clinic. Or attend an upcoming Laser Workshop.